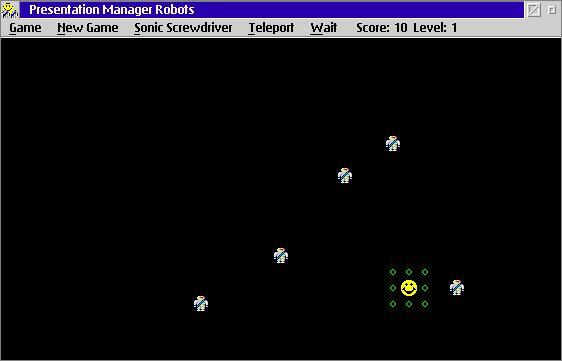 This program is a version of the classic UN*X game "robots" for the OS/2 Presentation Manager. The main idea is that you are chased by robots, and the object to is make them crash into each other before they get you. It's Smiley against the Evil Killer Robots. Smiley is hopelessly outnumbered, but with your intellect, you might be able to save him. Fortunately, for you and Smiley, the robots have the stupid habit of crashing into each other in their pursuit. The tools that you have available to you are a Sonic Screwdriver and a Teleporter Device. The Sonic Screwdriver obliterates all the robots adjacent to Smiley, but can only be used once per level. The Teleporter Device can be used to get Smiley out of a tight spot, but each time you use it, you run the risk of teleporting next to a robot (which spells certain doom for Smiley). Clicking the left mouse button moves Smiley in the direction of the mouse pointer (a question mark means that Smiley can't move in that direction). Available moves are shown by the green diamonds around Smiley. Clicking directly over Smiley takes a turn without making a move (letting the robots catch up). The menu bar provides access to the Teleporter and the Sonic Screwdriver. The "Wait" button (or the right mouse button) takes turns until there is a robot breathing down Smiley's neck. Points are awarded as follows : 10 points for every robot that crashes into another robot or into a robot heap, and 1 point for every robot obliterated with the Sonic Screwdriver. Bonuses are awarded for not using the Sonic Screwdriver on a particular level (50 points) and for successful teleports (1 point per visible robot). Special thanks to Brian Warkentine for his inspirational XROBOTS. There are many versions of robots around, and all the authors deserve credit. This version was written entirely from scratch, July 1993.
source zipfile: pmbots13.zip (55438 bytes). Kent H Lundberg. Last updated May 10, 2002.